The CP909 is the TR-909 clap sound analog generator in eurorack format. 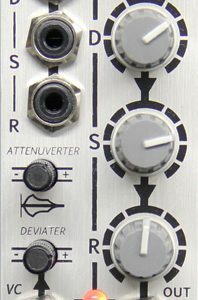 This is yet another low-cost analog drum generator from a legendary drum machine in your modular synthesizer, expanding your Tiptop Audio modular drum machine even further. The CP909 is an exact reproduction of the original analog circuit and, with the addition of just one extra knob, “trashing” the frequency of the internal noise generator, Tiptop have added greatly to the spectrum of sounds that can be generated – all that without compromising the signature sound of the TR-909 clap. The CP909 clap effect is made by a special triple-saw envelope generator that controls the gain of a vca. The sound source feeding into the vca is made by a quasi-random logic based noise generator; some might call it “digital noise” though this term might be misleading in today’s world of microcontrollers and sound samples. What really makes the noise generator is a ring of logic gates, so primitive, so 80’s, and that’s the sound of the 909 clap! The CP909 includes a high-powered output gain stage capable of producing hot signals. On the inputs, they have designed a pulse-shaper circuit so you can trigger the cp909 with trigger/gate signals from step sequencers, clock dividers, or any other pulse/clock sources. This eliminates the need to shape pulses sent to the module and ensures the same stable sound at peak power, regardless of your pulse source. 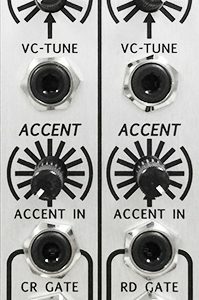 Based on the architecture of the 909, the accent input is versatile and able to take in both cv and gate signals for continuously changing dynamics. All these unique features make integrating this legendary sound generator into your modular synth easy, unleashing the power of real analog drums.